Worcester, MA– The Worcester Railers HC (31-29-7-4, 73pts) closed out the home portion of their 2018-19 regular season schedule with a come from behind 4-3 victory over the visiting Newfoundland Growlers (43-21-4-3,93pts) in front of 5,515 fans at the DCU Center on Saturday evening on Fan Appreciation Night presented by MGM Springfield. The Railers close out the regular season with a 3pm start in Glens Falls, NY vs. the Thunder on Sunday at 3pm. Tommy Kelley scored twice including the game winner at 16:47 of the third period for Worcester as Mitch Gillam made 27 saves on 30 shots in net for his 20thwin of the season. Semyon Der-Arguchinstev scored his first professional goal for Newfoundland while netminder Eric Levine made 25 saves in net as the Growlers coughed up a 3-1 lead. Josh Holmstrom and Ross Olsson also scored for Worcester while Nick Sorkin added two assists as the Railers snapped a season high eight game skid with the home victory. The Growlers grabbed a 3-1 lead in the first period which would make it in for an early night for starting goaltender Mitch Gillam through the first 13 minutes of play. Semyon Der-Arguchinstev (1st) scored his first pro goal at 1:25 followed by a power play goal by JJ Piccinich (9th) at 8:42 to give Newfoundland a 2-0 lead. Josh Holmstrom (14th) got Worcester on the board at 11:47 with a no look swing-a-rama backhand shot from five feet on top of the crease at 11:47 assisted by Nick Sorkin and Matt Schmalz. But the Growlers would strike again at 12:56 as Giorgio Estephan (20th) would end the period for Mitch Gillam with a snap shot from 30 feet to give the Growlers a 3-1 edge. Shots were 12-12 through 20 minutes of pay. Mitch Gillam would return for the second period after Blake Wojtala got injured at the end of the first frame and Gillam would make nine saves to keep the Growlers at bay. Tommy Kelley (5th) zipped a quick shot from seven feet on top of the crease to get the Railers back within a goal at 7:47 assisted by Tyler Barnes and Ryan Hitchcock. Worcester trailed 3-2 after 40 minutes with the Growlers holding a 21-20 shot advantage through two periods. Ross Olsson (2nd) tied the score at 3-3 at 2:35 of the third period after Ivan Chukarov’s shot from the point hit Olsson in front and Ross shuffled the puck into the net as he was on his side from on top of the crease. Tommy Kelley (6th) would net the game winner at 16:47 after a great feed from behind the net by Nick Sorkin to give the Railers their first and only lead of the hockey game. Mitch Gillam made 10 more saves in the third period as the Railers sent the big crowd home happy with the 4-3 victory. Notes: Three Stars: 3rd star: Semyon Der-Arguchinstev (1stpro goal) 2nd star: Josh Holmstrom (1-0-1) 1st star: Tommy Kelley (2-0-2) …. final shots were 31-29 in favor of Newfoundland…Eric Levine (4-4-4) made 25 saves on 29 shots Newfoundland… Mitch Gillam (20-16-5) made 27 saves on 30 shots for Worcester while Blake Wojtala was the backup and made 1 save in 7:04 of the first period…. Worcester went 0-for-2 on the power play while Newfoundland went 1-for-3…. 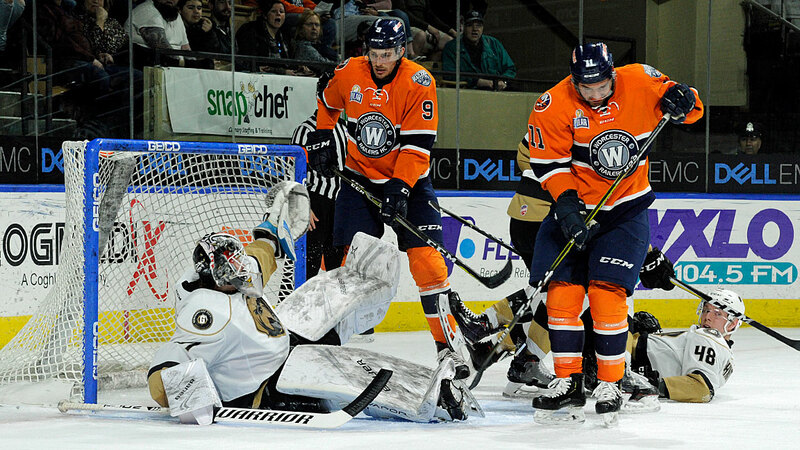 Kyle McKenzie (inj), Tommy Panico (inj), Alex Vanier (inj), Evan Buitenhuis (inj), Yanick Turcotte (susp), Rob Powers, Drew Callin, and Matty Gaudreau did not dress for Worcester….. Worcester finished 17-12-6-1 on home ice this season… 152,370 fans attended a Railers game at the DCU Center this season – an average of 4,232 fans per game this season….Worcester has 49 fighting majors this season – they had 45 last season….Tommy Kelley fired four shots on goal….Terry Virtue and Rick Middleton were a few of the names that suited up for the Bruins Alumni game before the Railers game vs. the Why Me All-Stars – the Bruins won 14-5. What’s on tap – FINAL GAME OF SEASON ON SUNDAY! On Sunday, the Railers travel to Glens Falls, NY to battle the Adirondack Thunder at 3pm. Coverage begins at 2:37pm on 98.9 Nash Icon. The Railers Tavernlocated behind the DCU Center provides hockey fans with a great pregame and postgame atmosphere all season long. Watch all road games broadcast live at Railers Tavern or watch on ECHLTV.com for a small fee. Listen to all Railers games live on 98.9 Nash ICONwith coverage beginning 30 minutes before puck drop with Eric Lindquist and Tom Matthews. Full season memberships, mini plans, and group tickets are on sale now by calling the Railers front office at 508-365-1750 or by visiting www.RailersHC.com.